The Atlanta Falcons may have made news this spring when the concession prices for their new stadium came out and showed bargains compared to the rest of the NFL. But fans of the Cleveland Indians and Arizona Diamondbacks already know a great deal – at least when it comes to beer. We pulled together the least expensive beer prices for all 30 MLB teams, and the Indians and Diamondbacks both offer beers for as little as $4 each. The only other team with a sub-$5 beer is the Los Angeles Angels, who come in at $4.50. How Much Will It Cost to See Your Favorite Team? 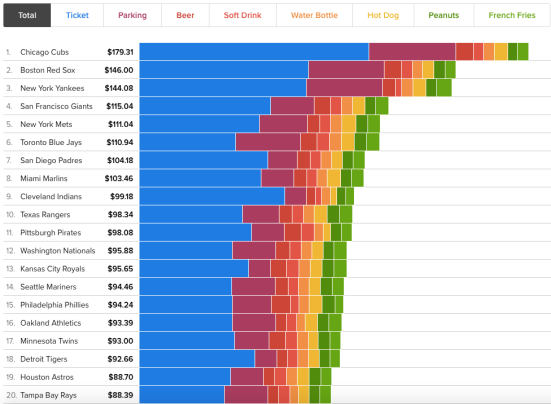 At the top of the chart is the Philadelphia Phillies, who charge $8.75 for their cheapest beer. The Chicago Cubs, Baltimore Orioles, Boston Red Sox and Pittsburgh Pirates also all reach the $8 mark. Of course beer cups do vary in size across the league, but fans looking for the least expensive option should plan their road trips to Cleveland or Phoenix. To see where every team ranks check out the full infographic here.